CARLSON TOOL & MACHINE CO. Proven leader for machine design, serving the needs of the brush making industry. 2012 marks the 75th Anniversary of Carlson Tool and Machine Company. 70 Years as a Major Player & Leader in the Manufacture of Brush making Equipment and Services. Carlson Tool was founded in 1937, in Aurora, Illinois, by John I. Carlson, a Swedish immigrant. The first Carlson Brush Machine was designed and built in 1937 at Carlson's first factory in a rented house on New York Street in Aurora. Rapid growth of Carlson Tool & Machine Company brought several location changes in Aurora. Recognizing the need for additional expansion founder John I. Carlson purchased the Kalzen Monument Works in Geneva, Illinois, and was joined by his son Cliffard D. Carlson. Their combined business and technical backgrounds quickly brought the firm recognition as one of the leaders in the design and manufacturing of Brush Making and Brush Related Equipment, both domestically and world-wide. Under the Leader Ship of John M. Carlson the company introduced 5 axis Computerized staple Set machines with pattern generation in 1980. Today Carlson-STI offers a full range of Semi-Automatic, Custom Computerized and Automated Brush Making Equipment. Staple Set, Metal Channel Strip Brush, Twisted in Wire and custom engineered projects. 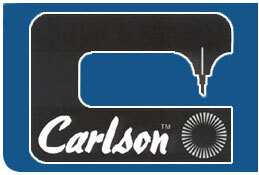 If you are not using a Carlson Machine, you are not experiencing your full profitability in Manufacturing Brushes. Today Carlson-STI is situated in a 50,000 square foot building in Elgin, Illinois, where they continue to Design and Develop New Brush Making Solutions. Keeping the current global economic situation in mind, Carlson-STI has introduced two new Universal drill and fill machine models in both two and 3 axes. This new equipment provides customers a flexible low cost brush making solution.